Jane P. Lord is a longtime Maine editor and even longer-time Maine resident. These are the last lines of our most revered summer camp song, “By a Glistening Lake.” It was sung through sobs on the last night of camp, at what was called the Memory Campfire. Camp was Kippewa, on Lake Cobbosseecontee in Monmouth. It was my eight-week Maine home (read, haven) for seven summers. I learned to swim, sail and water ski. I climbed Katahdin, sailed on a schooner, saw musicals at the Bowdoin summer theater, hammed it up in camp musicals, and ate lobster by the lake. 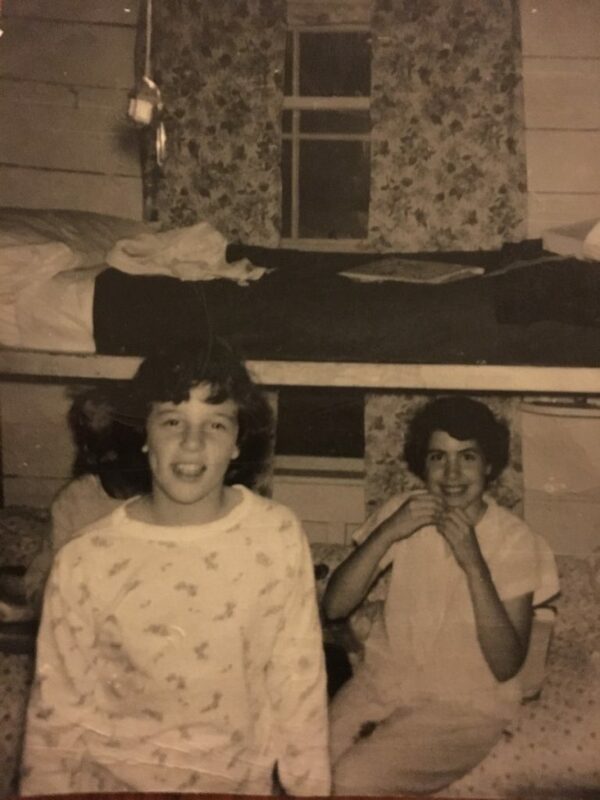 I slept on the top bunk in a rickety bunk bed and shared the cabin upkeep chores. I joined the rest of the kids in our rousing, post-meal songfests. While my enthusiasm was lacking for activities such as archery and tennis, I ramped it way up for the color-war sports contests. From the moment I boarded the bus to take us to camp that very first year, I never spent one second feeling homesick. That was an emotion I could not comprehend. I’d left behind parents in a shaky marriage, a bully for my only friend and a cloud of depression. Camp was a revelation: People liked me! I was popular in my bunk! I was spirited, social and confident. And oh, the friends. The wonderful, funny, smart and loyal friends I made. Marcia, Jackie, Sandy, Barbara, Dutchie, Patti – all lifelong friends. As kids, we exchanged letters in the winter. Sometimes we even saw each other. We counted the days until the next summer. The thought of camp indeed warmed my heart. Maine was where I wanted to be (and as an adult, I made sure that happened). Long after our camp days ended, we stayed connected – through college, graduation, career, marriage, kids, moving, divorce and illness. My heart broke when Marcia died 12 years ago from cancer. A year or so later, MS claimed Patti. Jackie’s liver transplant saved her life. We were connected in our souls to those summers in Maine at Kippewa. I vividly recall the moments when we had to say goodbye at the end of what was our last summer all together. The bus dropped a few of us off at the Howard Johnson in Portsmouth, where our parents were waiting to take us home. But they had to wait longer than they anticipated. Six or eight of us got off the bus, joined hands in a camp friendship circle, and through tears, sang that sob-inducing paean to solidarity, “Friends, Friends, Friends.” We hugged and we cried. Finally, the parents had had enough, the bus drivers had had enough and the other campers had had enough. We had to leave. For those seven summers, going home meant leaving Maine.